Roxanne Bejamin has been producing some of your favourite independent horror films and thrillers for years now. From V/H/S 1 & 2, to the recent cult indoctrination thriller ">Faults, her work behind the camera has generated a lot of chatter in the critical film community. So when we heard she was making her directorial debut with a segment in Southbound, we were extremely interested. On the eve of Southbound's debut on VOD, we got Benjamin on the line to talk about the genesis of her stranded, all-female band story, "Siren", how her latest project came together and what's next for the up-and-coming director. 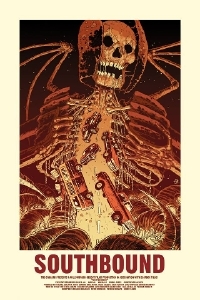 On a desolate stretch of desert highway, weary travelersâ€”two men on the run from their past, a band on their way to the next gig, a man struggling to get home, a brother in search of his long-lost sister and a family on vacationâ€”are forced to confront their worst fears and darkest secrets in these interwoven tales of terror and remorse on the open road.